Easter Hat decoration – a Fun and Easy Craft for Kids. coming of spring. 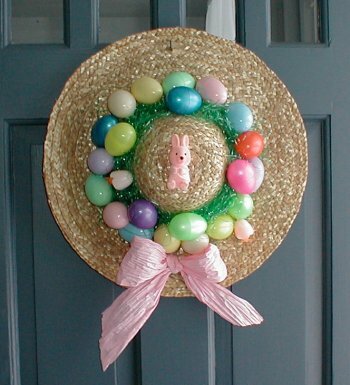 To help you celebrate, decorate your home’s front door with this very cute Easter hat. 12 Multi colored plastic Easter eggs. 1. With a glue gun, glue the Easter basket grass all around the base of the hat. 3. Form a bow and glue it on the bottom of the hat. 4. Hang the Easter hat on the front door. bunnies or any type of decoration that fits the theme.